Distribution area: In the whole of Thailand, usually lives near the coast, near brackish water and in mangrove swamps. Behaviour/habitat: They can be found in brackish water just as often as in fresh water. In fresh water, they are usually in rice fields and in pools where they can slide around in shallow water. The animal does not leave the water very often. Their food is mainly fish. However, they do also prey on frogs and crustaceans. 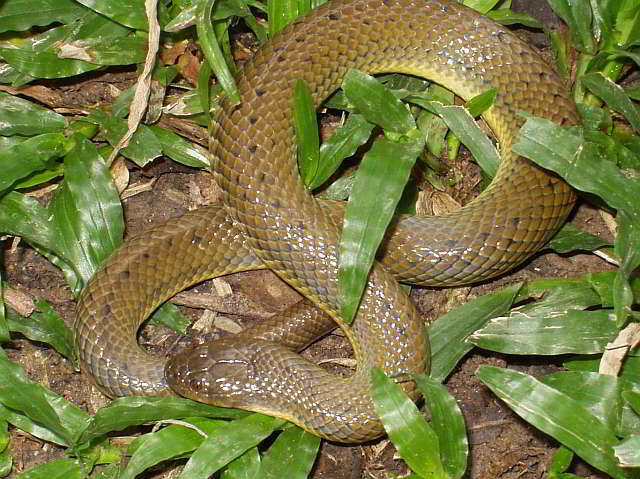 Length: Up to 1 m.
Behaviour/habitat: These snakes are mainly in or near the water. They can often be found in rice fields. On rainy days they retreat over large distances towards the inland. They mainly eat fish and frogs. If threatened, they do bite and in addition, they release a disgusting smelling secretion and faeces if attacked. 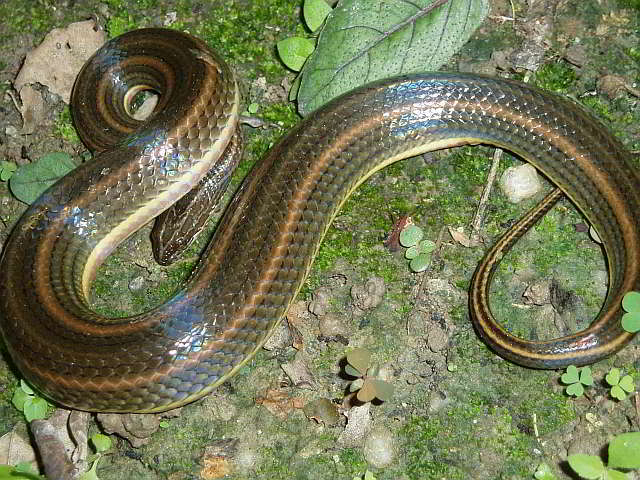 Behaviour/habitat/appearance: The striped water snake is a common snake in the damp lowlands of Thailand. The top of the body is grey to olive green and has dark grey to light brown vertical stripes. The stomach is white-yellowy. 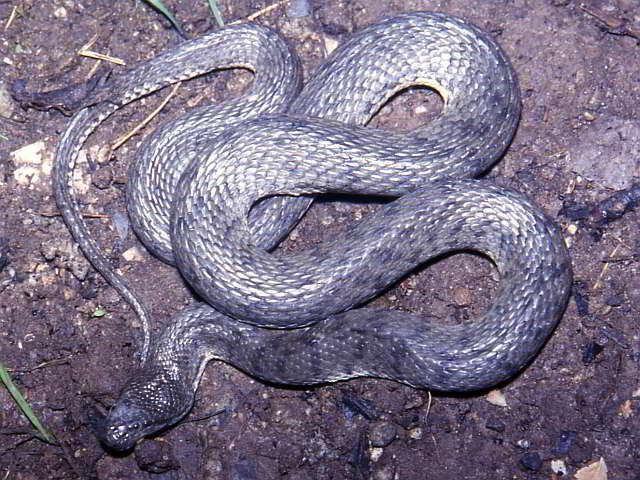 The snake can often be found near pools and ponds. They feed themselves on frogs, frog spawn and fish. Danger level: Enhydris enhydris belongs to the rearfanged snakes which has grooved fangs at the back of the jaw. They are , however, no danger to humans. The snake bite only leads to some short term pain in the bitten area. Behaviour/habitat: Just like the other Enhydri, the Enhydris jagori is also mainly found near water. Distribution area: Throughout Thailand in pools, lakes, rivers and rice fields. Behaviour: At the break of dawn they are on the hunt for frogs and fish. On land they move somewhat clumsily. If threatened, they pull their body into an S-form and attack the aggressor. Danger level: Although Enhydris plumbea is a rear fanged snake, no known case of human envenomation is known. Behaviour/habitat: The tentacled snake inhabits slowly moving or still waters which are muddied and unclear. It is found in freshwater, brackish water, and in seawater. In water, the tentacled snake uses its tail to grasp aquatic plants or branches and roots found under the water. It remains completely still, which has given it the Thai name “Ngu on to her krad”, which translates as the “board snake”. 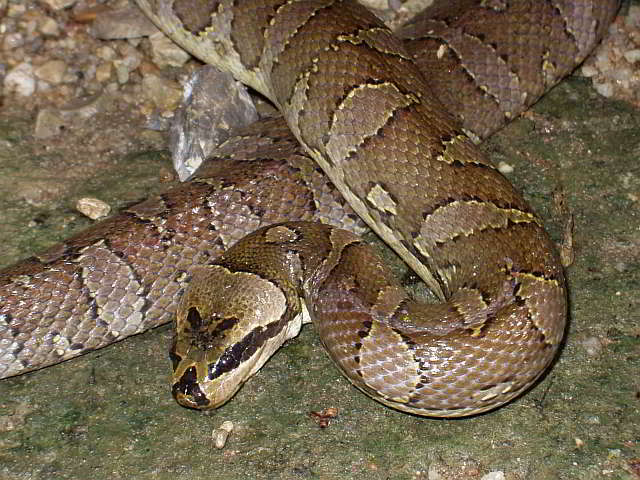 The snakes are active more often at dusk than during the day. It feeds on fish and crustaceans, which it does not pursue, but rather seizes if they come into range. It is accepted that the mobile tentacles on the head serves as lures for fish. During the dry season, if the water habitat of the snake dries up, it buries itself in the mud until the rains return. The snakes are easily identified by their two tentacles. The snake moves somewhat cumbersome on the shore. Erepton tentaculatus gives birth to between 5 and 13 living young, which have a length of between 200 and 390 mm. Danger level: Only mildly venomous. Even when held in the hands, the animals rarely even try to bite. Distribution area: To be found in the whole of Thailand, in pools, lakes and rivers. The only area in which they are not to be found is in the hills. 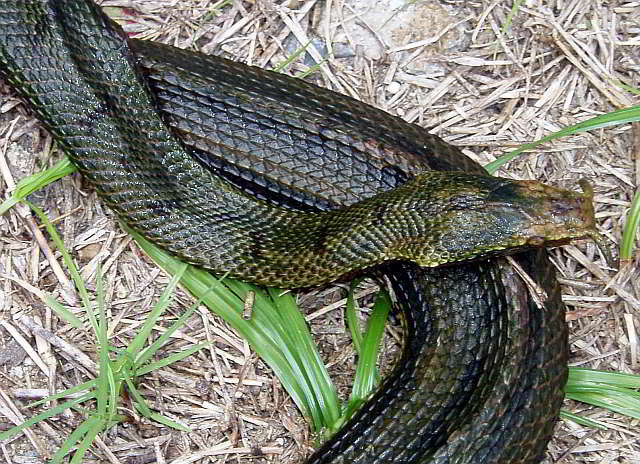 Behaviour: The water snake Homalopsis buccata lives in fresh and brackish waters. They inhabit lakes, ponds and rivers. The animals do, however, often leave the water and rest on the banks. Crab holes are often used as hide outs. This snake is nocturnal and feeds on fish, frogs and frog spawn. They are often caught up in fishing nets. The young snakes are born alive and have the same colour as the adult snakes. Danger level: Not dangerous for humans.